Thanks to Pointcloud, the new façade fronts seamlessly fit on the largely stripped Technohal of the University of Twente. Ever since the first years the University of Twente existed, its campus was adorned by the Technohal. The industrially-looking edifice (Van Emden/Choisy, 1970) was becoming outdated, and its function as a space for large-scale chemical experiments also belonged to the past. However, the architectural and cultural value of the building were sufficient reason for a grand renovation of the facilities and façades. Only the floors and steel structures remained untouched; the glass façade was fitted with slim steel (insulated) frames and darkened window panels. This will increase the Technohal’s transparency and keep its industrial look, all the while keeping to contemporary requirements for the Technical Medical Centre (TechMed Centre) of the University of Twente. Hermen Smelt was on the team that elaborated the architectural plans into a ready-to-execute design on behalf of Inbo. 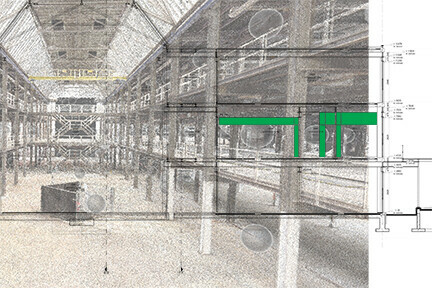 Based on the model of the architect (dvdp) and builder and the Pointcloud (the digital measurements) that we had received through Dura Vermeer, Inbo elaborated the ready-to-execute design in 3D Revit. The main challenge was to create an architectural model that would allow to skip measurements during construction. The Technohal is to be finished by mid-April. The building will become the new home of the cluster Health of the University of Twente.